It was hard to decide where to look first in Las Vegas this year at IBM’s flagship information management event. Coming as it did on the heels of a massive, sprawling Oracle Open World, it was also overwhelming, but distinguished itself immediately by its focus. Whereas Oracle has smashed together hardware systems, apps, middleware, java and development, systems management and database into a bewildering multi-site show, IBM continues to run separate events for Websphere, Rational, Tivoli, and Lotus. No single IBM event trumpets “we’re the biggest,” and they don’t take over the towns they’re in; the content seems a bit more manageable. And as an attendee who hopes to get a broad view, I’m happy with that. However, as I’ll discuss below, Oracle is winning the messaging war nonetheless. There was indeed talk of systems at IoD this year, as Smart Analytics Systems got a refresh and some added units on x-based platforms. Flash memory additions to the x-based 5600, bundling InfoSphere and Cognos along with an updated Linux release, provide the basis for a good story along with more cores, memory and storage. A similar story is possible for the POWER-based 7700, which also added the new Blue Darter solid state disk (SSD.) And the z audience gets the 9600, with its sidecar, the transparent offload to the Smart Analytics Optimizer. Yes, IBM has a column-based database, with innovative storage tweaks and an optimizer that knows when to use it and when not to. Great promise there. So what’s wrong with this picture? Try this: ask 10 IT people what Exadata is, and what Smart Analytics Systems are. Ask them who makes the offerings, and what they do. Go ahead…I’ll wait…. Back? OK. Here’s what I learned, after doing that experiment at 3 events attended by IT people (data people, in fact.) 8 of 10 I asked knew Oracle makes Exadata and it’s a wicked fast platform for data. 4 of 10 knew who makes the other one, and fewer knew why. On visibility and buzz, game Oracle. There is much more to talk about, and visibility and buzz are not everything. IBM’s numbers continue to be good, and nobody in Armonk is complaining. But the IBM Software brand needs to get more attention, more investment, and a tighter, more focused story. The good news? Conversations I’ve been having suggest that it will in 2011, and it’s about time. 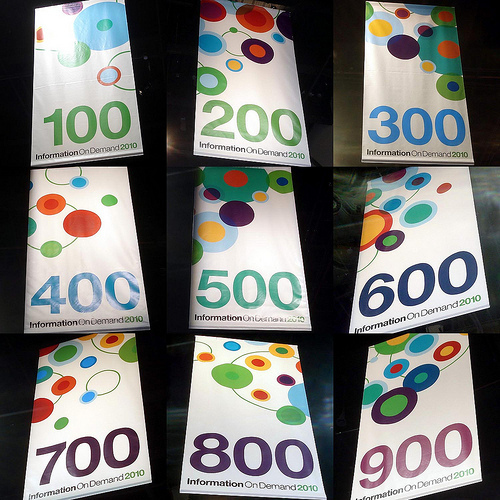 There were some big stories at IoD, the biggest of which were the launches of Cognos X (pronounced “ten,” and yes, they skipped 9. Let’s not dwell on that), the new version of DB2, also 10 (not pronounced “X” as far as I can tell), and updates to various InfoSphere offerings. I’ll talk about Cognos elsewhere. The DB2 launch was accompanied by updates to QMF, accessories, utilities, administration tools, and High Performance Unload. And, in another nod to branding gone mad, “Tivoli OMEGAMON XE for DB2 Performance Expert & Performance Monitor.” Seriously, IBM, it’s time to prune the brand tree. Candle (at least that doesn’t precede “OMEGAMON” in the name, and can we drop the caps now?) was acquired in 2006 – you can start to transition the brands already. DB2 10 features loads of performance improvements, added features including temporal support (which will be the topic of its own post soon), and a version-skip upgrade capability for users of Version 8. There is a double whammy here: IBM says DB2 10 uses 40% less CPU on zEnterprise, while the platform is delivering over 50 billion instructions per second. Small wonder that tests show it can support 6x as many users for SAP. DB2 on other platforms gets a new Advanced Enterprise edition, with data compression, new performance, administration, and tuning software, inheriting much of the high end goodness, and IBM says it costs less a “bare bones Oracle Database license,” i.e., one without many of the features DB2 bundles in. The Workgroup Edition now inherits pureScale, IBM’s cluster-based, shared-disk architecture first introduced on z for more granular scaling and improved availability and performance. This theme of capabilities moving from one platform to another is a perennial them of the IBM software portfolio – in all directions, as I’ve discussed before. Competing with Oracle was a key theme. IBM pointed out that while Oracle charges additional fees for compression, disaster recovery, security, partitioning, performance tuning, and active-active replication (each one a separately priced option), DB2 includes them. And it rolled out a series of customers for the analyst track who talked about their migration from Oracle and the power of the PL/SQL support in DB2. Hardware competition is part of the discussion now too; Roger Kay picked up nicely on another side of this story in a recent piece about several hundred hardware migrations to the POWER platform. Informix got a new version: 11.7 (pronounced “eleven dot seven,” I believe.) Its ability to scale capacity via Flexible Grid, which supports multi-version, multi-OS, multi-hardware collections of systems was praised by DHL Mexico for allowing them to keep hardware in place for its full planned lifespan, getting the most from their investment. Feature updates include multi-index scans, star join optimization and “Forest of Trees” indexes. IBM continues to push Informix performance, touting its integrated Time Series feature’s ability to work with streaming data, and cited Cisco’s use of Informix (it’s everywhere) as an example of its superior footprint, self-optimizing and self-healing qualities for embedded use. Here, the target is Microsoft’s SQL Server, and while the battle is uphill, IBM has had some successes as it rolls out a price and value-driven competition on this front as well. As the InfoSphere portfolio has grown, its role as the locus for the information supply chain has evolved dramatically. New releases of Information Server, MDM products, Warehouse and Optim continue the integration of the products and their increasingly coherent roles. IBM’s Information Governance Unified Process ties its point of view together into a model that unifies technology with process and provides multiple points of entry. Long experience in product and on the Services side has taught IBM that every project has to have immediate, measurable payback, and that collaboration between business and IT is the key. While IBM’s tools still struggle with usability, various analyst reports and surveys give it high marks for function. The usability barrier remains a key one, and the evidence of IBM’s increasing focus on it was everywhere. Facilitating alignment with requirements and process were key messages of Information Server 8.5, which showcased top-down and design, and of Master Data Management, where the addition of Initiate Composer with its blueprints and reusability focus for composite application development ups the ante. The Traceability Server improves visibility, and helps focus attention on catching validation problems early as well as including visibility of Websphere Application Server and MQ clustering. The unification of systems resources this enables, while still complex, goes a long way to simplifying resource linkage to the information supply chain. InfoSphere Warehouse continues to be the surrounding brand – not “DB2-based data warehouses,” but InfoSphere. The reasoning? Other things are bundled in besides the database – substantial value like Cognos (starter edition),cubing services, the SQL Warehousing Tool, the Federation Server, Design Studio, the Optim administration and development products, replication server, workload management, compression, data mining, text analytics, a console… this is a powerful, comprehensive story. And there’s more at the high end – but it’s a rarely told story. Much of the added stuff represents enormous value: time saved, best practices-supporting infrastructure that you don’t get with just a database purchase. Unfortunately, the story is rarely told that way, at least until the salesperson gets down to business. It needs to be more visible. As the gluing together of all these assets proceeds, InfoSphere Data Architect (IDA) now unifies logical, physical, dimensional and business glossary models, tying the warehouse together with Cognos and Rational. Optim Designer and Design studio use IDA as a core component for data definition and classification; Optim Designer focuses on the business objects, and Design Studio is used for warehouse tasks. Yes, the Optim brand continues too – as InfoSphere Optim. So InfoSphere is not just warehousing, it’s also governance. And Guardium goes in there too, for securing it all. A great deal of new capability exists in both places, tied together by a coalescing metadata strategy, improved discovery capabilities, and a “mastering your data” focus on subjects like data quality, growth management, test data, and information lifecycle support. The story is getting richer and increasingly value-oriented. It needs more paring down and brand simplification if IBM hopes to move into new name accounts. I expect to see just that happening in the year ahead. And more aggressive pursuit of Oracle in the market is the key, if IBM hopes to continue to grow into new accounts not in the loyalist camp today.